MB spotted this amazing tree, a native of South America, on the Cairns' Esplanade this morning on her way for a chinwag and coffee at the new Cocoa Amour on the Esplanade. 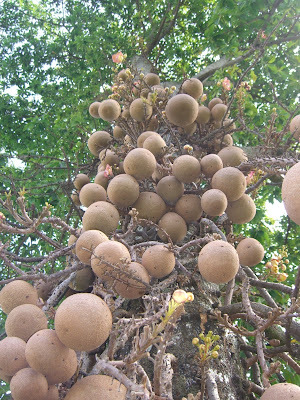 The fruit are as big as bowling balls and very heavy. The pink flowers are also very showy. There is also one of these trees at the Flecker Botanic Gardens in Cairns, however the one on the Esplanade is far more spectacular. It has to be the weirdest tree one could ever see.